AM: Antipodes Juliet Cleanser, First Aid Beauty Pads, Skin Owl Geranium Beauty Drops. PM: Oskia Renaissance Cleansing Gel, True Nature Botanicals Mist, Vedani Botanicals Treatment Oil. AM: Antipodes Juliet Cleanser, Olivine Love & Roses Mist, Skin Owl Geranium Beauty Oil. PM: Oskia Cleansing Gel, Dr. Hauschka Night Serum, Vedani Treatment Oil, Josh Rosebrook Oculus Eye Oil. AM: Antipodes Juliet, Love & Roses, Elemental Herbology Moisture Milk. PM: Oskia Cleansing Gel, Josh Rosebrook Moisturising Cleanser, Love & Roses, Skin Owl oil, True Nature Botanicals Retinol Serum for Sensitive Skin. AM: First Aid Beauty Pads, DIY Thyme Toner, Blissoma Pure Soothing Serum, Josh Rosebrook Oculus Eye Oil. PM: May Lindstrom The Problem Solver, Love & Roses, ML The Blue Cocoon. PM: Oskia Renaissance Cleansing Gel, DIY Thyme Toner, TNB Balancing Face Oil, Oculus. AM: FAB Pads, Love & Roses, Antipodes Worship Serum, Oculus. 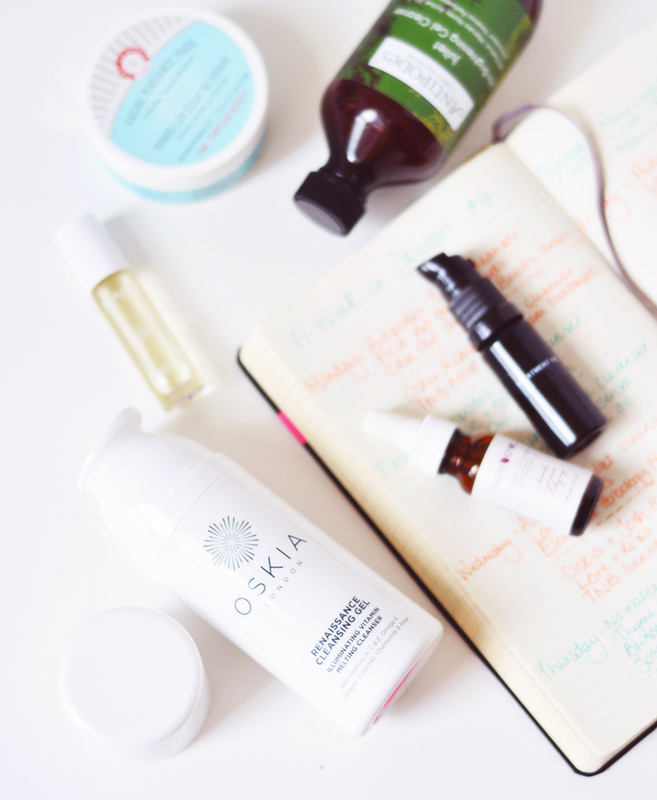 AM: Antipodes Juliet, DIY Thyme Toner, Blissoma Pure Serum. PM: Vedani Botanicals No21 Cleanser, Blissoma Free Cleanser, DIY Thyme Toner, Oculus, Antipodes Worship Serum, Vedani Treatment Oil. And that's the week! I really liked this routine and core group of products. I've since run out of the First Aid Beauty Facial Radiance Pads and need to repurchase as they're, well, fab, haha. The blissoma items were little samples I had (as was The Blue Cocoon) and the Vedani Botanicals items were still quite new at this point. As was the Antipodes Worship serum, which is nowhere near as nice as their apostle serum, sad. Have you tried any of the products I use? Have you ever kept a skincare diary?